Love the bedspread. 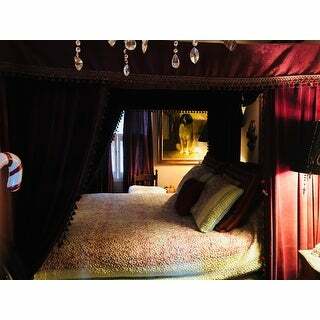 Only thing I would change=is I ordered a king for my queen bed as they usually aren’t big enough. This was very large and didn’t shrink ! The Palisades quilt set features tropical ferns and lotus blossoms in soft blue and green hues with a reverse coordinating solid color. The set is made from soft microfiber fabric and is machine washable for added convenience. Please note: Some options listed or picture may be currently out of stock. See option drop down for all in-stock options. This Barefoot Bungalow bedspread set is very pretty. BUT, I ordered a king size set, and it is enormous. About 12 inches too wide and 24 inches too long. 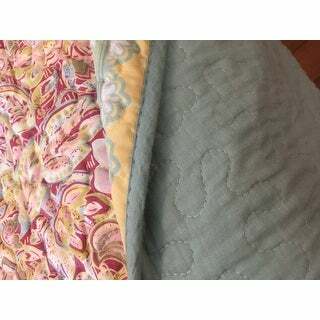 (And no, I don’t have a California King, and this quilt is clearly labeled ‘King size.’) The colors are softer and more subtle than is shown in photo. Still, it’s a very pretty quilt, but the main color is soft red, yet in the photo it emphasized the grays and aquas much better...which was what I wanted. Note: Quilt has a rectangle pattern in the center, which should fall in the center of blanket and follow the edges of the bed. But that rectangle is dragging the floor, since the quilt is CRAZY BIG. It was a shame, since it’s a pretty set that’s either getting returned to O-Stock, or will stay in my linen closet waiting to cover about 7-12 kids during a sleepover or something. This king size quilt is generous sized and colors were just as shown on line, with many options for accent colors. It helps create a serene setting for our guest room. 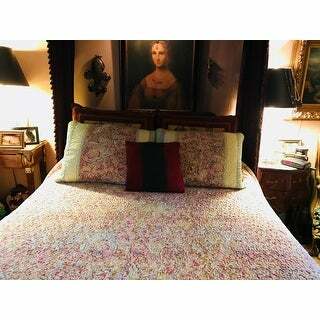 I love my new coverlet! It has all the colors of the room so it pulls the whole room together. The deep burgundy rug is the most color in the room and the small burgundy flowers are accented by the rug. Since the deep red is so deep, it is perfect to accent the spread with the other colors that lighten it up. The blue is beautiful and the spread is lined in this gorgeous shade of blue. The yellow/green border accentuates the other colors. 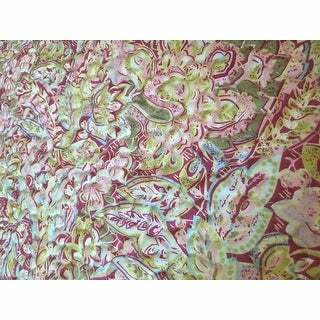 Since the print is small flowers/leaves, etc, the pattern is not overwhelming. It's perfect! Lovely quilt and shams. Color is accurate om my screen. Pretty colors of pink, spring green and light blue stripe. I bought the twin size quilt with one sham. The quilt is absolutely beautiful! The main part of the quilt are different colors of small pink and rose flowers on a medium blue background. The borders are stripes in the blue color, pale yellow and the pinks. Much more colorful than the pictures. I have washed it according to directions and now it's so soft and fluffy. I Love it! Looks very similar to posted picture. Not heavy weighed, very much a summer quilt/coverlet. This quilt is SO soft and falls generously where I hoped it would on my king sized bed. We love the weight of it too. I was looking for something to go well with our sage green wall color and this quilt does just that. The colors are exactly as pictured. It is perfect and exactly what I was looking for. I have not washed it yet but so far we are very happy with this purchase. Delivery was fine. Return at *** plus change not so much. The spread is rose and pink, not red as pictured. The print is extremely busy and poorly imprinted on the fabric. Unlike the picture, the bed spread still needs a bed skirt. I purchased the Full/Queen. Fits both size beds very well. I ended up putting it on the full size bed in the guest room because the colors of the walls and trim went very well with it (and now I didn't have to re-paint the master bedroom to match!) The colors are exactly as shown: yellow, green (lime & olive), cream, pink, red/violet. The fabric is soft and hangs well, not stiff. The reverse color is more aqua than blue or green. Comes with two pillow shams . . . best to fill them with a large, full pillow. I love it. This is a beautiful quilt. As others mentioned, it's not very pastel, but I was ok with that for the pink/burgundy colours. However, there is a LOT of yellow in this quilt, which doesn't show up in the photo. I don't like yellow, so I returned it. The quilt is good quality and the fabrics used are nice. The burgundy/pink design is nice, and the natural and sage colored border is very pretty. The blue used on the backing of the quilt is a soft, saturated blue -- not pastel, but not bright. If someone is ok with yellow being visually prominent, it will be a nice quilt for you. Nice colors , wish it was thicker. Love, Love, Love this beautiful colors great quality! Beautiful. Exactly as pictured. 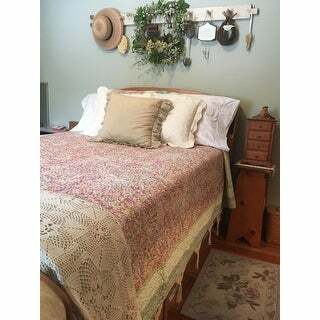 Gives the guest bedroom a great cottage feel. Very pretty quilt. Love the variety of colors. I bought this to "stage" an antique bed that I am upcycling. Bed is almost finished - I can't wait to set it up and see how the quilt brings the project together! Absolutely love this comforter! The colors are so pretty and the order was delivered quickly. Would definetly reccomend this to others. love the color and size of this quilt! Was beautiful but didn't fit my bed!! Love the quality of fabric and weight. Great lightweight quilt! The colors are accurate and the fabric is soft. It’s not heavy enough for the winter, but perfect for spring, summer and fall. Wearing well after a few months. Super cute bed set. Fits perfectly on a full sized bed. The photos are pretty accurate on the colors although it is much cuter in person. The quilt is warm but not bulky. Another great set! Colors are beautiful and the fabric is so soft. Great for curling up with at the end of the night. 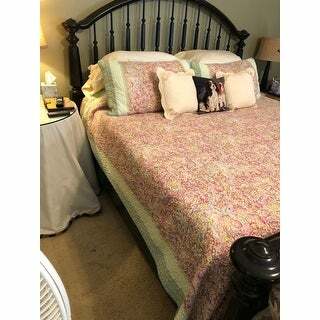 Fits my king size bed beautifuly and had no shrinkage when washed. Definitely a nice but for the price. Really pretty and a good price. "I noticed microfiber in the description. I’m looking for a cotton feel. What does a microfiber quilt feel like? " It feels like lovely cotton. This quilt feels like a cotton quilt. not sure why the microfiber content. But I don't feel it. Very much recommend this quilt! "Is the trim cream or white "
White with dominant yellow print. It does look creamy in the picture but it's white/yellow print. "Can you buy just the pillow shams in king size?" Unfortunately no, the shams are not available separately. yes, the king shams are available. I have just ordered an additional set. "Is there cream color around border or white?" It is white but has dominate yellow print on white. I love mine! "The "together" pillow on the bed, do you sell that?" "I didn't see anywhere the sizes need 96x96, so don't know if I should order the king as I have a Queen bed, but a deep mattress so queen aren't always wide enough. Could you tell me which would work best?" "Does the quilt have light gray in the border, backing/reverse side, or quilt pattern? Is the backing/reverse side light blue instead of gray?" There is no light gray in this quilt. It has a light blue backside with the same light blue around the edges of the front.